We caught up with one of our partners in the Philippines, the Global Initiative to adVance Entrepreneurship (GIVE), which shared progress there and in Cambodia. In the Philippines, GIVE and the Inner City Development Corporation (ICDC), one of the participating organizations in last year’s train-the-trainers workshop, have set up an entrepreneurship center in Manila that provides, among other things, Barefoot MBA lessons. 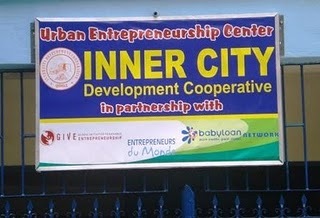 The center is set up as a co-op, with a membership cost of $20 payable via microloan. Of the borrowers, 40% are single mothers; the co-op provides child care. Zeny, one of our participants in the Philippines, is leading the charge for ICDC, which so far has trained more than 1,700 borrowers with the Barefoot MBA. She has noticed increased savings rates among participants, and GIVE is helping to collect supporting data. Zeny recently traveled to France, where she met with donors and shared the benefits of the Barefoot MBA. GIVE sees a need for a similar center in Phnom Penh, Cambodia. In addition to looking into making that a reality, it hopes to run a training this fall similar to what we ran in the Philippines last summer. We are encouraged by our partners’ progress in the Philippines and Cambodia and look forward to more to come.